and we have fun, springy happenings! Welcoming fans daily is.. Einstein! Einstein is a Brazilian-bred son of 1985 Horse of the Year and Kentucky Derby winner Spend a Buck. Trained by Helen Pitts, Einstein (Spend a Buck--Gay Charm, by Ghadeer) captured the 2009 Santa Anita Handicap (gr. I) and four grade I stakes on turf, including back-to-back triumphs in the Woodford Reserve Turf Classic (gr. IT) at Churchill Downs. 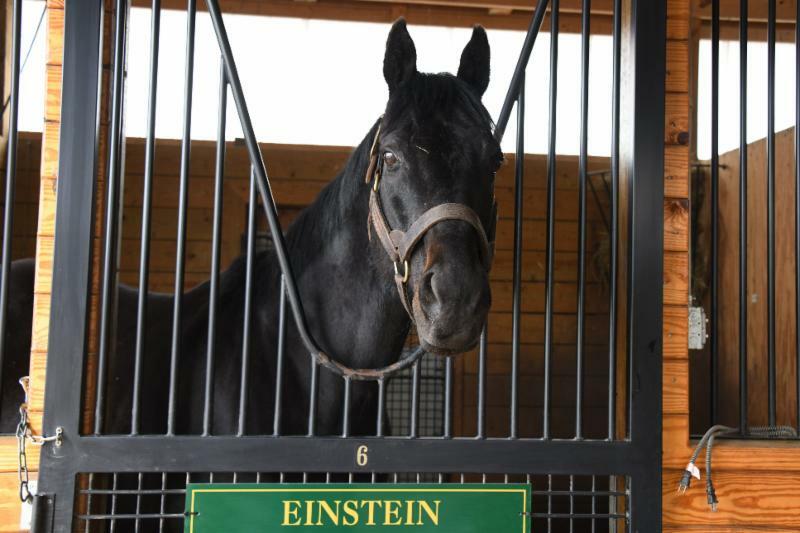 Einstein made 30 starts, winning 11 races. He won or placed in 13 stakes, all of which were graded, and his career earnings totaled $2,703,324. 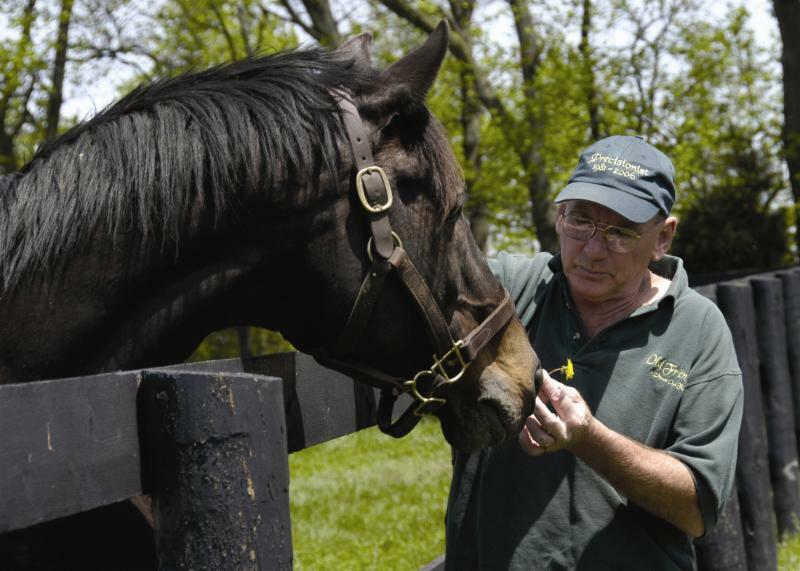 He retired from racing in 2010 to stand at Adena Springs near Paris, KY. He later stood at Adena Springs North in Ontario, Canada, and at Magali Farms near Santa Ynez, CA. His top runners include grade III winner Rankhasprivileges and multiple-stakes-placed E Equalsmcsquared. Help the Horses, Get a Book! We have two great gift premiums to raise money to put more hay in the barn, do some seeding, and spruce up the farm after a tough, wet winter. 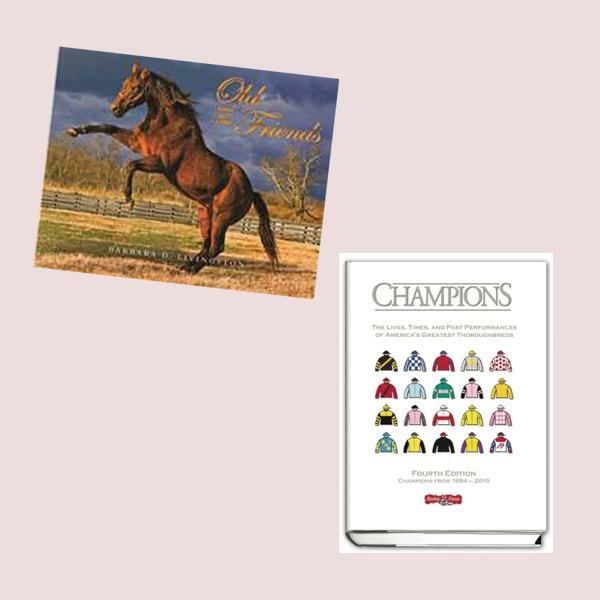 Donate $50 and receive a copy of of the Daily Racing Form's "Champions, Fourth Edition" the outstanding chronicle of the greatest Thoroughbreds of all time through a comprehensive listing of their past performances. It includes many of our retirees as well as 12th Triple crown Winner American Pharoah. 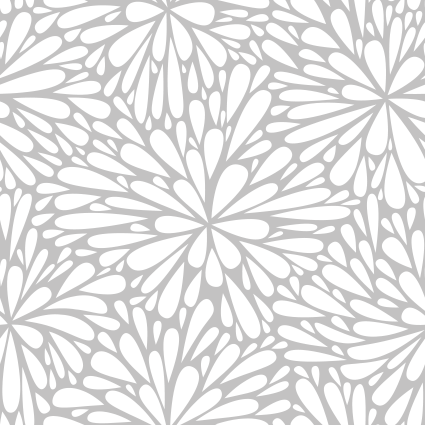 Donate $100 and we'll send you Barbara Livingston's memorable book, "Old and New Friends." This volume also highlights some of our Old Friends retirees. With a donation $150 or more you get both books! April 2 to April 15 only. Call us at 502-863-1775 to donate, or send a check to Old Friends, 1841 Paynes Depot Rd., Georgetown, KY 40324..
Our 15th Annual Homecoming Event! Guests will enjoy silent & live auctions of horse racing memorabilia, collectible halters, equine art, jewelry and more! 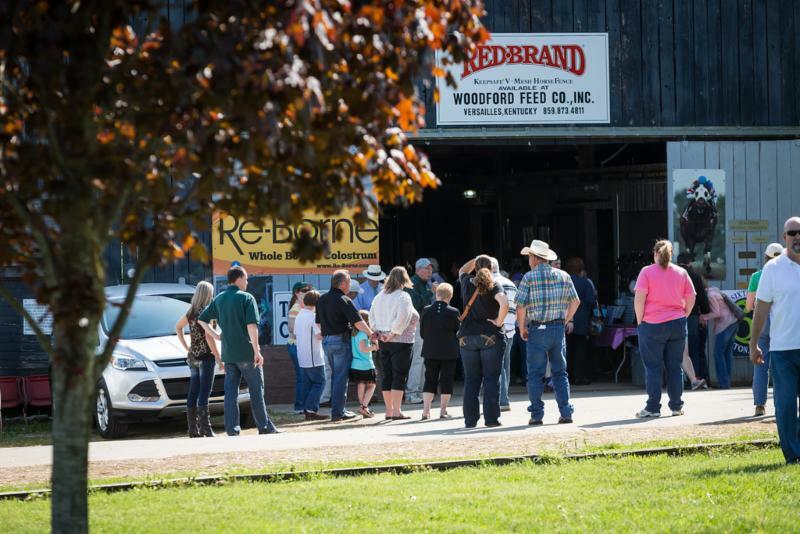 Book signing, catered BBQ, music and tours! Admission $30; 2019 Membership holders $15; kids 12 and under free. Call (502) 863-1775 for more information. War Emblem Tee - Time is running out! 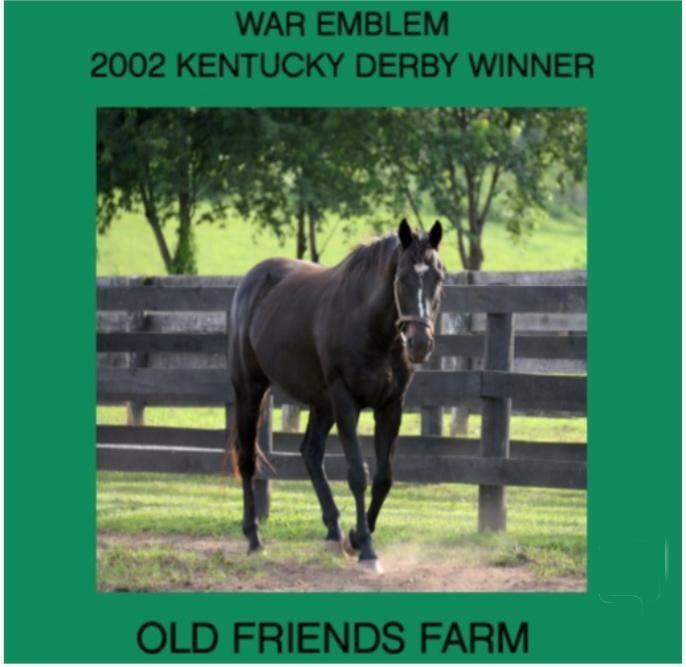 War Emblem.. in spring green. For a limited time, you can order t-shirts featuring 2002 Kentucky Derby winner War Emblem. Buy a shirt and support our horses! 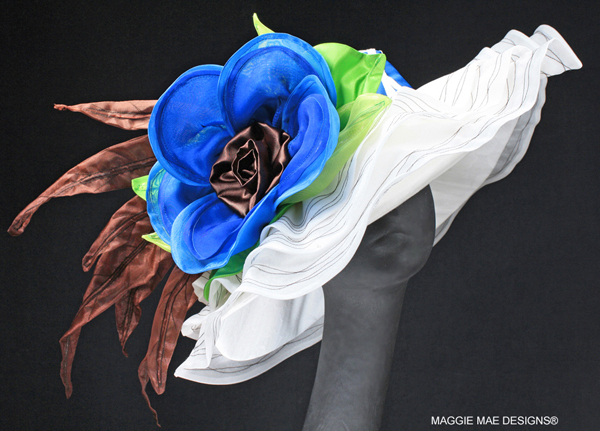 The last hat of this season's MAGGIE MAE DESIGNS® Hats Off to the Horses for Old Friends! This beautiful hand-crafted hat honors Nicanor, a stakes-placed runner, sire, and full brother to Kentucky Derby winner Barbaro. Thanks to chief photographer for Daily Racing Form and 6-time Eclipse Award winner, Barbara D. Livingston for her stunning images. Click here to bid! Old Friends is a 501 (c) (3) non-profit organization that cares for over 200 retired racehorses. It's Dream Chase Farm, located in Georgetown, KY, is open to tourists daily by appointment. Old Friends also has two satellite facilities: Old Friends at Cabin Creek: The Bobby Frankel Division in Greenfield Center, N.Y., and at Old Friends at Kentucky Downs in Franklin, KY. For more information on tours or to make a donation, contact the main farm at (502) 863-1775 or see their website at www.oldfriendsequine.org.